For other people named John Galbraith, see John Galbraith (disambiguation). 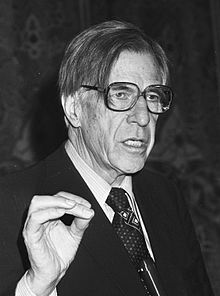 John Kenneth Galbraith[a] OC (October 15, 1908 – April 29, 2006), also known as Ken Galbraith, was a Canadian-born economist, public official, and diplomat, and a leading proponent of 20th-century American liberalism. His books on economic topics were bestsellers from the 1950s through the 2000s, during which time Galbraith fulfilled the role of public intellectual. As an economist, he leaned toward post-Keynesian economics from an institutionalist perspective. Galbraith was a long-time Harvard faculty member and stayed with Harvard University for half a century as a professor of economics. He was a prolific author and wrote four dozen books, including several novels, and published more than a thousand articles and essays on various subjects. Among his works was a trilogy on economics, American Capitalism (1952), The Affluent Society (1958), and The New Industrial State (1967). Some of his work has been criticized by economists such as Milton Friedman, Paul Krugman, and Robert Solow. Galbraith was active in Democratic Party politics, serving in the administrations of Franklin D. Roosevelt, Harry S. Truman, John F. Kennedy, and Lyndon B. Johnson. He served as United States Ambassador to India under the Kennedy administration. His political activism, literary output and outspokenness brought him wide fame during his lifetime. Galbraith was one of the few to receive both the World War II Medal of Freedom (1946) and the Presidential Medal of Freedom (2000) for his public service and contributions to science. The government of France made him a Commandeur de la Légion d'honneur. Galbraith was born on October 15, 1908, to Canadians of Scottish descent, Sarah Catherine (Kendall) and Archibald "Archie" Galbraith, in Iona Station, Ontario, Canada, and was raised in Dunwich Township, Ontario. He had three siblings: Alice, Catherine, and Archibald William (Bill). By the time he was a teenager, he had adopted the name Ken, and later disliked being called John. Galbraith grew to be a very tall man, attaining a height of 6 feet 9 inches (206 cm). His father was a farmer and school teacher. His mother, a homemaker and a community activist, died when he was fourteen years old. The family farm was located on Thomson Line. Both of his parents were supporters of the United Farmers of Ontario in the 1920s. His early years were spent at a one-room school which is still standing, on Willy's Side Road. Later, he went to Dutton High School and St. Thomas High School. In 1931, Galbraith graduated with a Bachelor of Science in Agriculture from the Ontario Agricultural College, which was then an associate agricultural college of the University of Toronto. He majored in animal husbandry. He was awarded a Giannini Scholarship in Agricultural Economics (receiving $60 per month) that allowed him to travel to Berkeley, California, where he received Master of Science and Doctor of Philosophy degrees in agricultural economics from the University of California, Berkeley. Galbraith was taught economics by Professor George Martin Peterson, and together they wrote an economics paper titled "The Concept of Marginal Land" in 1932 that was published in the American Journal of Agricultural Economics. After graduation in 1934, he started to work as an instructor at Harvard University. Galbraith taught intermittently at Harvard in the period 1934 to 1939. From 1939 to 1940, he taught at Princeton University. In 1937, he became a citizen of the United States and was no longer a British subject. [b] In the same year, he took a year-long fellowship at the University of Cambridge, England, where he was influenced by John Maynard Keynes. He then traveled in Europe for several months in 1938, attending an international economic conference and developing his ideas. His public service started in the era of New Deal when he joined the United States Department of Agriculture. From 1943 until 1948, he served as an editor of Fortune magazine. In 1949, he was appointed professor of economics at Harvard. The United States went into WWII with an economy still not fully recovered from the Great Depression. Because wartime production needs mandated large budget deficits and an accommodating monetary policy, inflation and a runaway wage-price spiral was seen as likely. 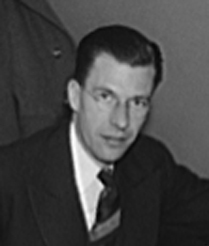 As a part of a team charged with keeping inflation from crippling the war effort, Galbraith served as a deputy head of the Office of Price Administration (OPA) during the Second World War in 1941–1943. The OPA directed the process of stabilization of prices and rents. On May 11, 1941, President Roosevelt signed the Executive Order 8734 which created the Office of Price Administration and Civilian Supply (OPACS). On August 28, 1941, an Executive Order 8875 transformed OPACS into the Office of Price Administration (OPA). After the US entered WWII in December 1941, OPA was tasked with rationing. The Emergency Price Control Act passed on January 30, 1942, legitimized the OPA as a separate federal agency. It merged OPA with two other agencies: Consumer Protection Division and Price Stabilization Division of the Advisory Commission to the Council of National Defense. The council was referred to as the National Defense Advisory Commission (NDAC), and was created on May 29, 1940. NDAC emphasized voluntary and advisory methods in keeping prices low. Leon Henderson, the NDAC commissioner for price stabilization, became the head of OPACS and of OPA in 1941–1942. He oversaw a mandatory and vigorous price regulation that started in May 1942 after OPA introduced the General Maximum Price Regulation (GMPR). It was heavily criticized by the American business community. In response, OPA mobilized the public on behalf of the new guidelines and said that it reduced the options for those who were seeking higher rents or prices. OPA had its own Enforcement Division, which documented the rising tide of violations: quarter million in 1943 and more than 300,000 during the next year. [H]e had first gone to work in the nation's capital in 1934 as a 25-year-old, fresh out of graduate school and just about to join the Harvard faculty as a young instructor. He had returned to Washington in mid-1940, after Paris fell to the Germans, initially to help ready the nation for war. Eighteen months later, after Pearl Harbor, he was then appointed to oversee the wartime economy as "price czar," charged with preventing inflation and corrupt price-gouging from devastating the economy as it swelled to produce the weapons and materiel needed to guarantee victory against fascism. In this, he and his colleagues at the Office of Price Administration had been stunningly successful, guiding an economy that quadrupled in size in less than five years without fanning the inflation that had haunted World War I, or leaving behind an unbalanced post-war collapse of the kind that had done such grievous damage to Europe in the 1920s. Opposition to the OPA came from conservatives in Congress and the business community. It undercut Galbraith and he was forced out in May 1943, accused of "communistic tendencies". He was hired promptly by conservative Republican and a dominant figure in American media and publisher of Time and Fortune magazines, Henry Luce. Galbraith worked for Luce for five years and expounded Keynesianism to the American business leadership. Luce allegedly said to President Kennedy, "I taught Galbraith how to write—and have regretted it ever since." Galbraith saw his role as educating the entire nation on how the economy worked, including the role of big corporations. He was combining his writing with numerous speeches to business groups and local Democratic party meetings, as well as frequently testifying before Congress. During the late stages of WWII in 1945, Galbraith was invited by Paul Nitze to serve as one of the directors of the Strategic Bombing Survey, initiated by the Office of Strategic Services. It was designed to assess the results of the aerial bombardments of Nazi Germany. Galbraith contributed to the survey's unconventional conclusion about general ineffectiveness of strategic bombing in stopping the war production in Germany, which went up instead. The conclusion created a controversy, with Nitze siding with the Pentagon officials, who declared the opposite. Reluctant to modify the survey's results, Galbraith described the willingness of public servants and institutions to bend the truth to please the Pentagon as, the "Pentagonania syndrome". In February 1946, Galbraith took a leave of absence from his magazine work for a senior position in the State Department as director of the Office of Economic Security Policy where he was nominally in charge of economic affairs regarding Germany, Japan, Austria, and South Korea. He was distrusted by the senior diplomats so he was relegated to routine work with few opportunities to make policy. Galbraith favored détente with the Soviet Union, along with Secretary of State James F. Byrnes and General Lucius D. Clay, a military governor of the US Zone in Germany from 1947 to 1949, but they were out of step with the containment policy then being developed by George Kennan and favored by the majority of the US major policymakers. After a disconcerting half-year, Galbraith resigned in September 1946 and went back to his magazine writing on economics issues. Later, he immortalized his frustration with "the ways of Foggy Bottom" in a satirical novel, The Triumph (1968). The postwar period also was memorable for Galbraith because of his work, along with Eleanor Roosevelt and Hubert Humphrey, to establish a progressive policy organization Americans for Democratic Action (ADA) in support of the cause of economic and social justice in 1947. 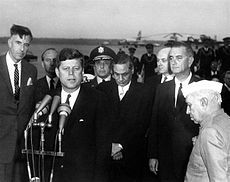 During his time as an adviser to President John F. Kennedy, Galbraith was appointed United States Ambassador to India from 1961 to 1963. His rapport with President Kennedy was such that he regularly bypassed the State Department and sent his diplomatic cables directly to the president. In India, he became a confidant of Prime Minister Jawaharlal Nehru and extensively advised the Indian government on economic matters. In 1966, when he was no longer ambassador, he told the United States Senate that one of the main causes of the 1965 Kashmir war was American military aid to Pakistan. While in India, he helped establish one of the first computer science departments, at the Indian Institute of Technology in Kanpur, Uttar Pradesh. Even after leaving office, Galbraith remained a friend and supporter of India. 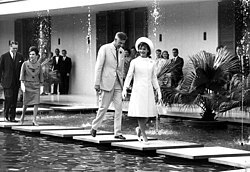 Because of his recommendation, First Lady of the United States Jacqueline Bouvier Kennedy undertook her 1962 diplomatic missions in India and Pakistan. In autumn 1972 Galbraith was an adviser and assistant to Nixon's rival candidate George McGovern in the election campaign for the American presidency. During this time (September 1972) he travelled in to China in his role as president of the American Economic Association (AEA) at the invitation of Mao Zedong's communist government with the economists Leontief and Tobin and in 1973 published an account of his experiences in A China Passage. Galbraith wrote that there was "no serious doubt that China is devising a highly effective economic system," "[d]issidents are brought firmly into line in China, but, one suspects, with great politeness," "Greater Shanghai ... has a better medical service than New York," and considered it not implausible that Chinese industrial and agricultural output was expanding annually at a rate of 10 to 11%. In 1972 he served as president of the American Economic Association. The Journal of Post Keynesian Economics benefited from Galbraith's support and he served as the chairman of its board from its beginning. During the shooting of The World at War, a British television documentary series (1973–74), Galbraith described his experiences in the Roosevelt war administration. Among other things, he spoke about the initial confusion during the first meeting of the major departmental leaders about kapok and its use. Galbraith also talked about rationing and especially about trickery during fuel allocation. In December 1977, he met the Palauan senator Roman Tmetuchl and eventually became an unpaid adviser to the Palau Political Status Commission. He advocated for minimal financial requirement and infrastructure projects. In 1979 he addressed Palau's legislature and participated in a seminar for the delegates to the Palau Constitutional Convention. He became the first person to earn honorary citizenship of Palau. In 1984, he visited the USSR, writing that the Soviet economy had made "great material progress" as, "in contrast to Western industrial economy," the USSR "makes full use of its manpower." In 1985, the American Humanist Association named him the Humanist of the Year. The Association for Asian Studies (AAS) conferred its 1987 Award for Distinguished Contributions to Asian Studies. In 1997 he was made an Officer of the Order of Canada and in 2000 he was awarded the US Presidential Medal of Freedom. He also was awarded an honorary doctorate from Memorial University of Newfoundland at the fall convocation of 1999, another contribution to the impressive collection of approximately fifty academic honorary degrees bestowed on Galbraith. In 2000, he was awarded the Leontief Prize for his outstanding contribution to economic theory by the Global Development and Environment Institute. The library in his hometown Dutton, Ontario was renamed the John Kenneth Galbraith Reference Library in honor of his attachment to the library and his contributions to the new building. On April 29, 2006, Galbraith died in Cambridge, Massachusetts, of natural causes at the age of 97, after a two-week stay in a hospital. On September 17, 1937, Galbraith married Catherine Merriam Atwater, whom he met while she was a Radcliffe graduate student. Their marriage lasted for 68 years. The Galbraiths resided in Cambridge, Massachusetts, and had a summer home in Newfane, Vermont. They had four sons: J. Alan Galbraith is a partner in the Washington, DC, law firm Williams & Connolly; Douglas Galbraith died in childhood of leukemia; Peter W. Galbraith has been an American diplomat who served as Ambassador to Croatia and is a commentator on American foreign policy, particularly in the Balkans and the Middle East; James K. Galbraith is a progressive economist at the University of Texas at Austin Lyndon B. Johnson School of Public Affairs. The Galbraiths also had ten grandchildren. A memorial plaque stands adjoining a stone inukshuk overlooking the Galbraith family farm on the Thompson (Hogg) Line just east of the Willey Sideroad, just north of the one room school he attended. The family home—a large white farm house—still stands, as do many of the original farm buildings. Even before becoming a president of the American Economic Association, Galbraith was considered as an iconoclast by many economists. This is partly because he rejected the technical analysis and mathematical modelling of neoclassical economics as being divorced from reality. Following Thorstein Veblen, he believed that economic activity could not be distilled into inviolable laws, but rather was a complex product of the cultural and political milieu in which it occurs. In particular, he posited that important factors, such as the separation between corporate ownership and management, oligopoly, and the influence of government and military spending had been largely neglected by most economists because they are not amenable to axiomatic descriptions. In this sense, he worked as much in political economy as in classical economics. His work included several best selling books throughout the fifties and sixties. His major contribution to the field of economics is the so-called American capitalism trilogy: The Affluent Society (1958), The New Industrial State (1967), and Economics and the Public Purpose (1973). Written in a clear and concise style, they were comprehensible to lay readers, not just economists. After his retirement from Harvard as the Paul M. Warburg Professor of Economics, Emeritus, he remained in the public spotlight by continuing to write 21 new books, as well as completing a script in 1977 for a major series on economics for PBS and BBC television—The Age of Uncertainty, broadcast in 38 countries. In addition to his books, he wrote hundreds of essays and a number of novels. Among his novels, A Tenured Professor achieved particular critical acclaim. Galbraith wrote book reviews, e.g., of The Report from Iron Mountain on the Possibility and Desirability of Peace, a 1967 political satire, under the pen name of Herschel McLandress, a name of a fictional Scottish mentor featured in the Tenured Professor. He also used the pseudonym, Mark Épernay, when he published The McLandress Dimension in 1963. Galbraith was an important figure in 20th-century institutional economics, and provided an exemplary institutionalist perspective on economic power. Among his numerous writings, Galbraith cherished The New Industrial State and The Affluent Society as his two best. As for the later works, economist and Galbraith friend Mike Sharpe visited him in 2004, on which occasion Galbraith gave Sharpe a copy of what would be Galbraith's last book, The Economics of Innocent Fraud. Galbraith confided in Sharpe that "this is my best book", an assertion Galbraith delivered "a little mischievously." After the beginning of the Great Recession of 2008, Galbraith's The Great Crash, 1929 (1955) and other books containing warnings about the dangers of an unrestrained speculative mood without proper government oversight found an attentive readership again. In 2010, the Library of America published a new edition of Galbraith's major works, edited by his son, James K. Galbraith: The Affluent Society & Other Writings, 1952–1967: American Capitalism, The Great Crash, 1929, The Affluent Society, and The New Industrial State. On this occasion, Bill Moyers interviewed James K. Galbraith about his father, his works, and his legacy. In American Capitalism: The Concept of Countervailing Power, published in 1952, Galbraith concluded that the American economy was managed by a triumvirate of big business, big labor, and an activist government. Galbraith defined the actions of the industry lobby groups and unions as countervailing power. He contrasted this arrangement with the period prior to the previous Depression, when big business had relatively free rein over the economy. His 1955 bestseller The Great Crash, 1929 describes the Wall Street meltdown of stock prices and how markets progressively become decoupled from reality in a speculative boom. The book is also a platform for Galbraith's humor and keen insights into human behavior when wealth is threatened. It has never been out of print. In The Affluent Society (1958), which became a bestseller, Galbraith outlined his view that to become successful, post–World War II America should make large investments in items such as highways and education, using funds from general taxation. Galbraith also critiqued the assumption that continually increasing material production is a sign of economic and societal health. Because of this Galbraith is sometimes considered one of the first post-materialists. In this book, he popularized the old phrase "conventional wisdom". Galbraith worked on the book while in Switzerland and had originally titled it Why The Poor Are Poor, but changed it to The Affluent Society at his wife's suggestion. The Affluent Society contributed (likely to a significant degree, given that Galbraith had the ear of President Kennedy) to the "war on poverty", the government spending policy introduced by the administrations of Kennedy and Johnson. In 1966, Galbraith was invited by the BBC to present the Reith Lectures, a series of radio broadcasts, which he titled The New Industrial State. Across six broadcasts, he explored the economics of production and the effect large corporations could have over the state. In the print edition of The New Industrial State (1967), Galbraith expanded his analysis of the role of power in economic life, arguing that very few industries in the United States fit the model of perfect competition. A central concept of the book is the revised sequence. The 'conventional wisdom' in economic thought portrays economic life as a set of competitive markets governed, ultimately, by the decisions of sovereign consumers. In this original sequence, the control of the production process flows from consumers of commodities to the organizations that produce those commodities. In the revised sequence, this flow is reversed and businesses exercise control over consumers by advertising and related salesmanship activities. The revised sequence concept applies only to the industrial system—that is, the manufacturing core of the economy in which each industry contains only a handful of very powerful corporations. It does not apply to the market system in the Galbraithian dual economy. In the market system, composed of the vast majority of business organizations, price competition remains the dominant form of social control. In the industrial system, however, composed of the 1,000 or so largest corporations, competitive price theory obscures the relation to the price system of these large and powerful corporations. In Galbraith's view, the principal function of market relations in this industrial system is, not to constrain the power of the corporate behemoths, but to serve as an instrument for the implementation of their power. Moreover, the power of these corporations extends into commercial culture and politics, allowing them to exercise considerable influence upon popular social attitudes and value judgments. That this power is exercised in the shortsighted interest of expanding commodity production and the status of the few is both inconsistent with democracy and a barrier to achieving the quality of life that the new industrial state with its affluence could provide. The New Industrial State not only provided Galbraith with another best-selling book, it also extended once again, the currency of institutionalist economic thought. The book also filled a very pressing need in the late 1960s. The conventional theory of monopoly power in economic life maintains that the monopolist will attempt to restrict supply in order to maintain price above its competitive level. The social cost of this monopoly power is a decrease in both allocative efficiency and the equity of income distribution. This conventional economic analysis of the role of monopoly power did not adequately address popular concern about the large corporation in the late 1960s. The growing concern focused on the role of the corporation in politics, the damage done to the natural environment by an unmitigated commitment to economic growth, and the perversion of advertising and other pecuniary aspects of culture. The New Industrial State gave a plausible explanation of the power structure involved in generating these problems and found a very receptive audience among the rising American counterculture and political activists. A third related work was, Economics and the Public Purpose (1973), in which he expanded on these themes by discussing, among other issues, the subservient role of women in the unrewarded management of ever-greater consumption, and the role of the technostructure in the large firm in influencing perceptions of sound economic policy aims. In A Short History of Financial Euphoria (1994), he traces speculative bubbles through several centuries, and argues that they are inherent in the free market system because of "mass psychology" and the "vested interest in error that accompanies speculative euphoria." Also, financial memory is "notoriously short": what currently seems to be a "new financial instrument" is inevitably nothing of the sort. Galbraith cautions: "The world of finance hails the invention of the wheel over and over again, often in a slightly more unstable version." Crucial to his analysis is the assertion that the common factor in boom-and-bust is the creation of debt to finance speculation, which "becomes dangerously out of scale in relation to the underlying means of payment." The financial crisis of 2008, which took many economists by surprise, seemed to confirm many of Galbraith's theses. Galbraith's main ideas focused around the influence of the market power of large corporations. He believed that this market power weakened the widely accepted principle of consumer sovereignty, allowing corporations to be price makers, rather than price takers, allowing corporations with the strongest market power to increase the production of their goods beyond an efficient amount. He further believed that market power played a major role in inflation. He argued that corporations and trade unions could only increase prices to the extent to which that their market power allowed. He argued that in situations of excessive market power, price controls effectively controlled inflation, but cautioned against using them in markets that were basically efficient such as agricultural goods and housing. He noted that price controls were much easier to enforce in industries with relatively few buyers and sellers. :244 Galbraith's view of market power was not entirely negative; he also noted that the power of US firms played a part in the success of the US economy. In The Affluent Society Galbraith asserts that classical economic theory was true for the eras before the present, which were times of "poverty"; now, however, we have moved from an age of poverty to an age of "affluence", and for such an age, a completely new economic theory is needed. Galbraith's main argument is that as society becomes relatively more affluent, so private business must create consumer demand through advertising, and while this generates artificial affluence through the production of commercial goods and services, the public sector becomes neglected. He points out that while many Americans were able to purchase luxury items, their parks were polluted and their children attended poorly maintained schools. He argues that markets alone will under-provide (or fail to provide at all) for many public goods, whereas private goods are typically "over-provided" due to the process of advertising creating an artificial demand above the individual's basic needs. This emphasis on the power of advertising and consequent over-consumption may have anticipated the drop in savings rates in the US and elsewhere in the developing world. Galbraith proposed curbing the consumption of certain products through greater use of pigovian taxes and land value taxes, arguing that this could be more efficient than other forms of taxation, such as labor taxes. Galbraith's major proposal was a program he called "investment in men"—a large-scale, publicly funded education program aimed at empowering ordinary citizens. An International Symposium to honor John Kenneth Galbraith, sponsored by the l'Université du Littoral Côte d'Opale, Dunkerque and the Institut de Gestion Sociale, Paris, France, was held in September 2004 in Paris. A special issue Commemorating John Kenneth Galbraith's Centenary of the Review of Political Economy was dedicated in 2008 to Galbraith's contribution to economics. Many reformers—Galbraith is not alone in this—have as their basic objection to a free market that it frustrates them in achieving their reforms, because it enables people to have what they want, not what the reformers want. Hence every reformer has a strong tendency to be averse to a free market. Nobel Prize-winning economist Robert Solow, in a review of The New Industrial State, points at Galbraith's lack for empiricism and selectiveness in his use of evidence. He points out that "It may be unjust and pointless to consider the degree of literal truth of each of the assertions that make up this argument. One would hardly discuss Gulliver's Travels by debating whether there really are any little people, or criticize the Grande Jatte because objects aren't made up of tiny dots. Nevertheless, it may help to judge the truth of Galbraith's." Richard Parker, in his biography, John Kenneth Galbraith: His Life, His Economics, His Politics, characterizes Galbraith as a more complex thinker. Galbraith's primary purpose in Capitalism: The Concept of Countervailing Power (1952) was, ironically, to show that big business was now necessary to the American economy to maintain the technological progress that drives economic growth. Galbraith knew that the "countervailing power", which included government regulation and collective bargaining, was necessary to balanced and efficient markets. In The New Industrial State (1967), Galbraith argued that the dominant American corporations had created a technostructure that closely controlled both consumer demand and market growth through advertising and marketing. While Galbraith defended government intervention, Parker notes that he also believed that government and big business worked together to maintain stability. Paul Krugman downplayed Galbraith's stature as an academic economist in 1994. In Peddling Prosperity, he places Galbraith as one among many "policy entrepreneurs"—either economists, or think tank writers, left and right—who write solely for the public, as opposed to those who write for other academics, and who are, therefore, liable to make unwarranted diagnoses and offer over-simplistic answers to complex economic problems. Krugman asserts that Galbraith was never taken seriously by fellow academics, who instead viewed him as more of a "media personality". For example, Krugman believes that Galbraith's work, The New Industrial State, is not considered to be "real economic theory", and that Economics in Perspective is "remarkably ill-informed". The first edition of The Scotch was published in the UK under two alternative titles: as Made to Last and The Non-potable Scotch: A Memoir of the Clansmen in Canada. It was illustrated by Samuel H. Bryant. Galbraith's account of his boyhood environment in Elgin County in southern Ontario was added in 1963. He considered it his finest piece of writing. Galbraith memoir, A Life in Our Times was published in 1981. It contains discussion of his thoughts, his life, and his times. In 2004, the publication of an authorized biography, John Kenneth Galbraith: His Life, His Politics, His Economics by a friend and fellow progressive economist Richard Parker renewed interest in Galbraith's life journey and legacy. John Kenneth Galbraith was one of the few people to receive both the World War II Medal of Freedom and the Presidential Medal of Freedom; respectively in 1946 from President Truman and in 2000 from President Bill Clinton. He was a recipient of Lomonosov Gold Medal in 1993 for his contributions to science. He also was appointed to the Order of Canada in 1997 and, in 2001, awarded the Padma Vibhushan, India's second highest civilian award, for his contributions to strengthening ties between India and the United States. In 2010, he became the first economist to have his works included in the Library of America series. ^ Canada did not have its own citizenship at the time, but later the United States and Canada acknowledged that their citizens, who had taken out citizenship in the others' countries, were recognized as having also retained their original citizenship, and Galbraith died as he had been born—a Canadian, although he had previously been amply honored as a Canadian as well as American. ^ Stiglitz, Joseph E. (December 28, 2006) "John Kenneth Galbraith understood capitalism as lived – not as theorized". The Christian Science Monitor. ^ Keller, Robert R. (1983). "Keynesian and Institutional Economics: Compatibility and Complementarity?". Journal of Economic Issues. 17 (4): 1087–95. doi:10.1080/00213624.1983.11504189. JSTOR 4225383. ^ Davidson, Paul (2005). "Galbraith and the Post Keynesians". Journal of Post Keynesian Economics. 28 (1): 103–13. JSTOR 4225383. ^ a b c Marglin, Stephen A.; Parker, Richard; Sen, Amartya; Friedman, Benjamin M. (February 7, 2008). "John Kenneth Galbraith". Harvard Gazette. Retrieved July 2, 2013. ^ "John Kenneth Galbraith". The Economist. May 4, 2006. Retrieved July 3, 2013. ^ a b "John Kenneth Galbraith, Longtime Economics Professor, Dies at 97". Harvard Crimson. April 2006. Retrieved July 3, 2013. ^ Galbraith, John Kenneth. The Scotch. Toronto: Macmillan, 1964. ^ a b c d e f g Dunn, Stephen P.; Pressman, Steven (2005). "The Economic Contributions of John Kenneth Galbraith" (PDF). Review of Political Economy. 17 (2): 161–209. doi:10.1080/09538250500067254. Archived from the original (PDF) on November 29, 2013. ^ "John Kenneth Galbraith". August 16, 2012. ^ Peterson, G. M.; Galbraith, J. K. (1932). "Am. J. Agric. Econ. (1932) 14 (2): 295-310 (link last visited 23 March 2017)" (PDF). Journal of Farm Economics. 14 (2): 295. doi:10.2307/1230112. JSTOR 1230112. ^ Galbraith (1981) ch. 6. ^ a b "The Personal Papers of John Kenneth Galbraith (1908–2006): Biographical Note" (PDF). National Archives and Records Administration: John F. Kennedy Library. Archived from the original (PDF) on January 6, 2014. Retrieved July 3, 2013. ^ Albalate, D. (2014). The privatisation and nationalisation of European roads: Success and failure in public-private partnerships. Cheltenham, UK: Edward Elgar, p. YIII. ^ Rockoff, Hugh (2012) America's Economic Way of War: War and the U.S. Economy from the Spanish–American War to the Persian Gulf War. Cambridge: Cambridge University Press. ISBN 0521676738. ^ Digests of Interpretation of the General Maximum Price Regulation. Washington, DC: Office of Price Administration, 1942. ^ Miller, J. P. (1943). "The Tactics of Retail Price Control". The Quarterly Journal of Economics. 57 (4): 497–521. doi:10.2307/1884653. JSTOR 1884653. ^ Price Control, O.P.A. : The Emergency Price Control Act, the President's Executive Orders, Price Control Procedure Regulations, Blanket Price Freezing Order, what Every Retailer Should Know, OPA Financial Report Forms. [Washington, DC]: Commerce Clearing House, 1942. ^ Mansfield, Harvey C. et al. (1948) A Short History of OPA, Office of Temporary Controls, Office of Price Administration. ^ Booknotes interview with Galbraith Archived March 3, 2016, at the Wayback Machine on A Journey Through Economic Time, November 13, 1994. ^ a b Steele, Jonathan (April 5, 2002). "Last of the old-style liberals". The Guardian Profile: John Kenneth Galbraith. The Guardian. Retrieved July 4, 2013. ^ Pressman, Steven (2009). Leading Contemporary Economists: Economics at the Cutting Edge. London: Taylor & Francis. p. 286. ^ a b "Richard Parker : The Legacy of John Kenneth Galbraith". johnkennethgalbraith.com. ^ a b "J K Galbraith" (PDF). RES Newsletter, July 2006, no.132. Royal Economic Society. Retrieved July 3, 2013. ^ Waligorski, Conrad (2006). John Kenneth Galbraith: The Economist As Political Theorist. Rowman & Littlefield. p. 8. ISBN 978-0-7425-3149-9. ^ "United States Strategic Bombing Survey Reports". www.ibiblio.org. Retrieved July 3, 2013. ^ Carroll, James (2006). House of War: The Pentagon and the Disastrous Rise of American Power. Boston: Houghton Mifflin Co. ISBN 0618872019. p. 178. ^ Galbraith (1981) ch. 16. ^ Parker, pp. 203, 216. ^ Galbraith, John Kenneth. The Triumph: A Novel of Modern Diplomacy. Boston, Mass: Houghton Mifflin, 1968. ^ a b c Athale, Anil (July 28, 2003). "India-China war 'accidental:' Galbraith". The Rediff Special. Rediff India Abroad. Retrieved July 4, 2013. ^ Sundararajan, Saroja (2010). Kashmir Crisis Unholy Anglo Pak Nexus. Gyan Publishing House. pp. 299–. ISBN 978-81-7835-808-6. ^ Hayashi, Stuart K. (2015). Hunting Down Social Darwinism: Will This Canard Go Extinct?. Lexington Books. p. 253. ISBN 9780739186718. ^ "Past AEA Officers". American Economic Association. Archived from the original on September 20, 2008. Retrieved October 10, 2008. ^ Shuster, Donald R. (2002). Roman Tmetuchl: A Palauan Visionary. Roman Tmetuchl Family Trust. pp. 209–13. ISBN 978-982-9064-01-1. ^ Gvosdev, Nikolas K. (2017). The Strange Death of Soviet Communism: A Postscript. Routledge. ISBN 9781351473200. ^ Jones, Milo; Silberzahn, Philippe (2013). Constructing Cassandra: Reframing Intelligence Failure at the CIA, 1947–2001. Stanford University Press. p. 102. ISBN 9780804787154. ^ a b "Order of Canada". May 17, 2007. Archived from the original on May 17, 2007. ^ "John Kenneth Galbraith in St. John's". Canadian Broadcasting Corporation. October 21, 1999. Retrieved October 12, 2008. ^ Noble, Holcomb B.; Martin, Douglas (April 30, 2006). "John Kenneth Galbraith, 97, Dies; Economist Held a Mirror to Society". The New York Times. Retrieved July 3, 2013. ^ Collins, Phillip Darrell and Collins, Paul David (2004) The Ascendancy of the Scientific Dictatorship: An Examination of Epistemic Autocracy from the 19th to the 21st Century. New York: IUniverse. ISBN 0595311644. p. 125. ^ "Galbraith, John Kenneth". encyclopedia.com. 2009. ^ Galbraith, John Kenneth (1963). The McLandress Dimension. Boston: Houghton Mifflin. ^ Adams, Philip (1999). Interview on Radio National, Late Night Live. Australian Broadcasting Corporation. Archived from the original on February 14, 2006. Retrieved January 17, 2006. . Accessed January 17, 2006. ^ Sharpe, Mike (2006). "John Kenneth Galbraith, 1908–2006". Challenge: The Magazine of Economic Affairs. 49 (4): 7. doi:10.2753/cha0577-5132490401. ^ Moyers, Bill and Galbraith, James K. (February 22, 2011). The Unconventional Wisdom of John Kenneth Galbraith: A Conversation with Bill Moyers and James K. Galbraith. Part 1–4 (Video). The Grolier Club, New York City. November 17, 2010.: The Library of America. ^ Noble, Holcomb B. and Martin, Douglas (April 30, 2006) John Kenneth Galbraith, 97, Dies; Economist, Diplomat and Writer. The New York Times. ^ a b "The Reith Lectures". BBC Radio 4. Retrieved July 3, 2013. ^ "The Reith Lectures, J K Galbraith: The New Industrial State (1966)". BBC Radio 4. Retrieved July 3, 2013. ^ Galbraith, John K (1970). "Economics as a System of Belief" (PDF). American Economic Review. 60 (2): 469–78. Archived from the original (PDF) on March 26, 2009. ^ a b Galbraith JK. (1977). Money: Where It Came, Whence It Went. Houghton Mifflin. ^ Bourke, Joe. "Opinion: Land Value Tax – an old idea with lots of modern supporters". Retrieved September 24, 2013. ^ Laperche, Blandine and Dimitri Uzunidis. John Kenneth Galbraith and the Future of Economics. Papers from the International Symposium Honoring John Kenneth Galbraith Held in Paris in September 2004. Basingstoke, England: Palgrave Macmillan, 2005. ^ "Special Issue of the Review of Political Economy: Commemorating John Kenneth Galbraith's Centenary". Taylor & Francis. 2008. Retrieved July 2, 2013. ^ "The New Industrial State: Son of Affluence". Retrieved September 26, 2017. ^ Madrick, J. (May 26, 2005) "A Mind of His Own: Review of John Kenneth Galbraith: His Life, His Economics, His Politics." Archived March 9, 2016, at the Wayback Machine The New York Review of Books. ^ Krugman, Paul (1994) Peddling Prosperity. Scranton, Pennsylvania: W. W. Norton. ISBN 978-0-393-31292-8. pp. 10–15. ^ Galbraith, John Kenneth (1964). The Scotch. Boston: Houghton Mifflin. ^ College, Bard. "Bard College Catalogue". www.bard.edu. ^ "Honorary Degree Recipients - Board of Trustees - Brandeis University". www.brandeis.edu. ^ "University of Guelph - Document Center". uoguelph.civicweb.net. ^ "Honorary Degrees". December 23, 2014. ^ "Honorary Degrees" (PDF). president.umich.edu. ^ "Honorary Degrees" (PDF). queensu.ca. ^ "Honorary Degrees: 1900-1999 - Knox College Honorary Degrees - Knox College". www.knox.edu. ^ "Honorary degree recipients, 1885–2015 - Vice President for Research and Graduate Studies". vprgs.msu.edu. ^ "MSU Honorary Degree Recipients: Alphabetical List - Vice President for Research and Graduate Studies". vprgs.msu.edu. ^ "Honorary Degree Recipients - University Secretariat". secretariat.info.yorku.ca. ^ "Honorary Degree Recipients - Honorary Degrees - Carleton College". apps.carleton.edu. ^ "Past Honorary Degree Recipients". ^ "Past Honorary Degrees - Grinnell College". www.grinnell.edu. ^ "Honorary Degree Recipients (Chronological)" (PDF). mcmaster.ca. ^ "Honorary Degrees - Smith College". www.smith.edu. Parker, Richard (2005). John Kenneth Galbraith: His Life, His Politics, His Economics. New York: Farrar, Straus, and Giroux. ISBN 978-0226646770. Feeney, Mark (April 30, 2006). "John Kenneth Galbraith, writer, economist, dies". The Boston Globe. Noble, Holcomb B.; Martin, Douglas (April 30, 2006). "John Kenneth Galbraith, 97, Dies; Economist Held a Mirror to Society". The New York Times. Retrieved May 6, 2010. Barnes, Bart (May 1, 2006). "John Kenneth Galbraith; Popularized Modern Economics". The Washington Post. Retrieved May 6, 2010. "Famed economist John Kenneth Galbraith dies at 97". USA Today. April 30, 2006. Retrieved July 11, 2013. "John Kenneth Galbraith, Longtime Economics Professor, Dies at 97". Harvard Crimson. April 30, 2006. Retrieved July 3, 2013. Gewertz, Ken (May 4, 2006). "John Kenneth Galbraith, economist, professor, and author: Harvard icon dies at 97". Harvard University Gazette. Archived from the original on February 8, 2011. Retrieved July 11, 2013. Hodgson, Godfrey (May 1, 2006). "Professor J. K. Galbraith: Author of 'The Affluent Society' and one of the 'action intellectuals' of mid-20th-century America". The Independent. Retrieved July 11, 2013. "Obituary: John Kenneth Galbraith". BBC News. April 30, 2006. Retrieved July 11, 2013. Hession, Charles H (1972). John Kenneth Galbraith & his critics. New York: New American Library. LCCN 78176428. Keaney, Michael, ed. (2001). Economist with a public purpose: essays in honour of John Kenneth Galbraith. Routledge frontiers of political economy. London ; New York: Routledge. ISBN 978-0-415-21292-2. Reisman, David A. (1980). Galbraith and market capitalism. New York: New York University Press. ISBN 978-0-8147-7380-2. Sobel, Robert (1980). The worldly economists. New York: Free Press. ISBN 978-0-02-929780-3. Stone, Irving (1970). There was light: Autobiography of a university: Berkeley, 1868–1968 (1st ed.). Garden City, N.Y: Doubleday. LCCN 77078738. Waligorski, Conrad (2006). John Kenneth Galbraith: the economist as political theorist. 20th century political thinkers. Lanham, Md: Rowman & Littlefield. ISBN 978-0-7425-3148-2. Galbraith, John Kenneth (2001). Williams, Andrea D. (ed.). The essential Galbraith. Boston: Houghton Mifflin. ISBN 978-0-618-11963-9. Galbraith, John Kenneth (2017). Holt, Richard P. F. (ed.). The selected letters of John Kenneth Galbraith. New York, NY: Cambridge University Press. ISBN 9781107019881. Galbraith, John Kenneth (2004). Stanfield, J. Ron; Stanfield, Jacqueline Bloom (eds.). Interviews with John Kenneth Galbraith. Conversations with public intellectuals series. Jackson: University Press of Mississippi. ISBN 978-1-57806-610-0. Wikimedia Commons has media related to John Kenneth Galbraith. John Kenneth Galbraith (1908–2006). The Concise Encyclopedia of Economics. Library of Economics and Liberty (2nd ed.). Liberty Fund. 2008.